How was it done previously with no text jumping, or does the API or whatever no longer exist in 57? How to disable the loading image too? The icon is there since years. Before that there was no loading animation on tabs. No need to reply/post on Github about this, since you are asking about code for Firefox 52. My questions were regarding 57 though. Will that work in 57? Yes, it works in Firefox up to 59. I would like to remove the "View Bookmarks Sidebar" and "Show All Bookmarks" menus from the bookmarks button, but when I do it, there is a separator left over and I do not know how to hide it, it does not have any "ID" that I can identify. How do I hide it? I use the Nuvola theme in Basilisk. Between the back/forward buttons, there is a drop down history arrow. CTR allows me to move the back/forward arrows to the right of the location bar, but the drop down history arrow does not move with them. Is there any way that I can move them with the back/forward buttons, or can the drop down arrow be hidden? That back/forward dropmarker is created by Nuvola theme, not by the browser or CTR. It is part of the location bar container, so there is no way to move it. CTR offers an own movable back/forward dropmarker, but it does not get styled by Nuvola theme. I am happy enough to use the back/forward buttons with their inbuilt history functionality. Is there any chance you could tell me how to fix the Location Bar Enhancer breadcrumbed urlbar being off center? Try to increase location bar size too. Your second problem sound like a Firefox bug. Not sure what I could do about it. You could try to add one code to userChrome.css (browser ui) and another one to userContent.css (web content) and leave Firefox settings default. That way things might work out the correct way. Aris wrote: Try to increase location bar size too. 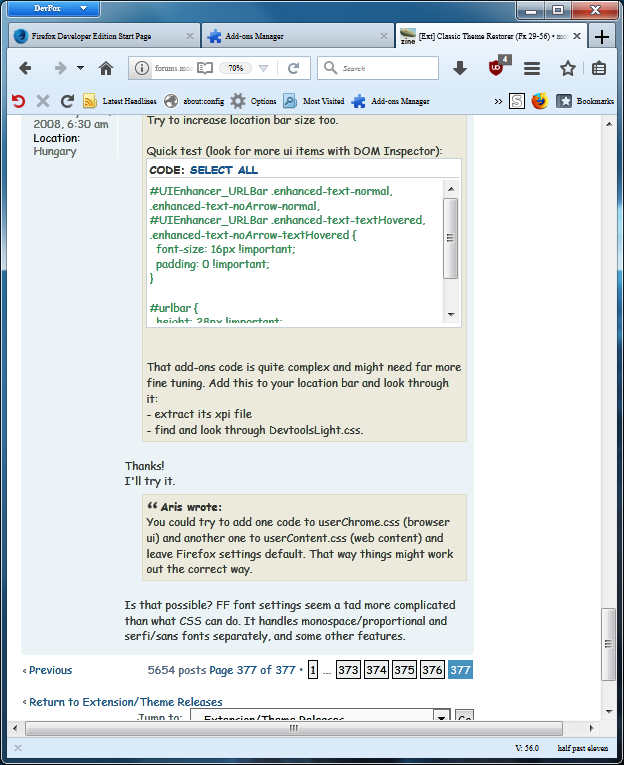 - find and look through DevtoolsLight.css. Aris wrote: You could try to add one code to userChrome.css (browser ui) and another one to userContent.css (web content) and leave Firefox settings default. That way things might work out the correct way. Is that possible? FF font settings seem a tad more complicated than what CSS can do. It handles monospace/proportional and serfi/sans fonts separately, and some other features. Sure, I just tried it in Fx56.